Sugar, the simplest form of carbohydrate, is a common dietary additive in the form of white table sugar, brown sugar, molasses, honey, maple syrup, corn syrup and high-fructose corn syrup. Fruits and dairy products contain naturally occurring sugars. For many years, consumers have wrongly associated eating sugar with hyperactivity, especially in children. While eating excess amounts of sugar has a number of negative health effects, it won't make you hyper. The perception that sugar causes hyperactivity in children may be a product of parents' preconceptions about sugar, according to Associate Professor Barbara J. Strupp at the Cornell University Division of Nutritional Sciences and Department of Psychology. Children, as well as adults, often consume sugary products like cake and candy at parties and other social events associated with excitement and activity. The party environment, rather than the sugar, causes partygoers to become hyper. 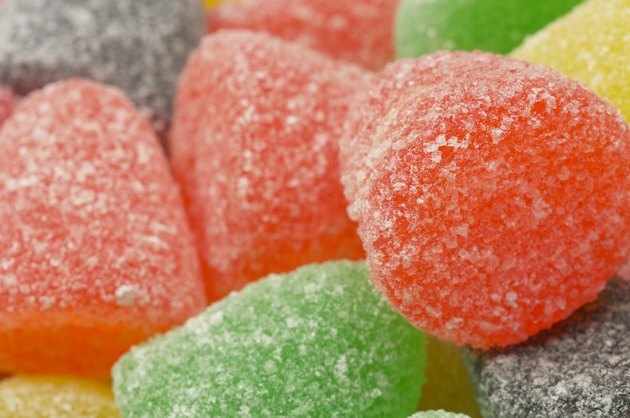 Controlled field studies do not support an association between sugar consumption and hyperactive behavior, according to registered dietitian Janice Hermann at the Alabama Cooperative Extension Service. Glucose, or sugar, is brain food, according to the Franklin Institute. Eating simple sugars that go straight into the blood may provide a short burst of glucose fuel to the brain, creating the sensation of an alertness boost. However, the insulin released to counter the sugar influx quickly reduces blood sugar, causing weakness and confusion, rather than hyperactivity. Brain neurons cannot store sugar for later use, and require a slow, steady source of glucose from slowly digested complex carbohydrates rather than a quick, unhealthy burst from sugar consumption. Eating a diet high in sugar can lower HDL, or "good," cholesterol levels, raise serum triglyceride levels, and otherwise increase the risk of cardiovascular disease, according to a "Los Angeles Times" report of a 2010 study by researchers from Emory University. Sugar is calorie dense and nutrient poor. A diet high in sugar can lead to weight gain and nutritional deficiencies that increase risk of cardiovascular disease and can lead to tiredness, loss of breath and low energy. Sugar in the form of high-fructose corn syrup, the most common form of sugar in soft drinks, leads to even more weight gain and its related negative health consequences than ordinary table sugar, according to researchers at Princeton University. Eating sugar may raise the body's available energy levels in the short term, but the insulin released to metabolize that sugar will soon lead to a drop in energy, according to Texas Women's University. Sugar can enhance available energy during exercise, but the effect is only noticeable and positive during intense athletic activity lasting 30 minutes or longer, according to the American Heart Association. When blood glucose and liver and muscle glycogen are depleted due to intense prolonged exercise, an intake of blood sugar can provide a burst of replacement fuel that re-energizes the competitive athlete. This effect does not occur when consuming sugar during ordinary, moderate physical activity, like walking.